Made up on lost sleep. We had a Stake Conference. A couple of interesting moments. First, there is a Latino brother on our High Council whose first name is Angel, and whose middle name in Moroni. So while they were sustaining the officers, they went through the entire High Council, and finally got to him. Every member of the High Council stood up as his name was being announced. Finally they got to Angel Moroni, and to make things more interesting, for one reason or another he could not be there, so his seat was empty. Then there was a talk on the Articles of Faith. A story was mentioned (probably from around 40 years ago) of how a man was traveling on a bus from New York to San Francisco, and in Salt Lake City a little girl sat right next to him. He saw a sign on the highway that said "Visit the Mormon Sunday School", and asked the girl to tell her what Mormons believed. She recited all 13 articles of faith, and discussed each one. The man was impressed, and looked up the missionaries at his first opportunity. He ended up getting baptized. I thought about how the times have changed. The girl reminded me of my daughter Jenny. First, I would not trust Jenny to go alone on a bus even for a short trip, and, unfortunately, if for some reason she had to and there was no other alternative, I would definitely tell her not to talk to any men. Second, when I drove on I-80 from SLC to San Francisco a couple of years ago I do not recall seeing signs inviting you to visit the Mormon Sunday School. Instead, there are plenty of signs inviting you to gamble in Wendover, followed by several signs later on once you pass Wendover telling you not to pick up hitchhikers because you are near a correctional facility. Ironically, the correctional facility is located in a place called Independence Valley. Jeff - 9.96 seconds - tried many times, most of the time was around 11 seconds. me - 14.65 on my best attempt. I've tried many times, and most of the time got 18. Benjamin - 15.2 in his best attempt. In all others he got too nervous and was taking longer than 20 seconds. I would be interested to see what others can do. A.M. 15.1 alone in 1:48:03. Did 8x100 strides, and a pickup for a mile in 5:53. I did the strides because I remembered it would be a good idea. The mile pickup was accidental. I saw a lady riding a bike in front of me, and decided I wanted to pass her. Then I did not want her to pass me back, so I sped up. Then I decided to hold the pace for the whole mile. P.M. 1 with Julia in 11:28, 1.5 with Jenny in 13:24, 2 with Benjamin in 17:21, and 0.7 alone in 5:15. Pushed Jacob in the single stroller when I ran with Jenny and Benjamin. A.M. Ran 15 in 1:57:56. First 8 with Brad and Josse. Did 0.25 in 1:27 on a post-VPB chase. The right Croc now officially has a hole. About 2mm wide. Still in runnable condition, though. P.M. 1 with Julia in 10:56, 1.5 with Jenny in 13:16, 2 with Benjamin in 15:23, 0.7 alone in 4:49, and also ran to the ESL class at the church and back because it was cold. Saw a small leaf-burning fire on the other side of the Provo River that apparently got out of control. They had to call the firefighters. A.M. 10.1 with Jeff and Josse in 1:22:57. Had some interesting conversations. Discussed potty training since Joseph started his yesterday and was very successful. Then discussed the importance of mothers. A home without a mother is like an ice hockey team without a goalee. Then discussed when it is appropriate to do speed work. I told Josse she should not do any until she breaks 1:26 in a non-aided half in Utah, and that Michelle should not do any until she breaks 1:20. The logic is that both have plenty of natural speed to do it, and if they are not doing it they are being held back by the lack of aerobic endurance rather than the lack of speed. Crocs - 483.75 miles. The hole on the right shoe is up to about 4mm. It is about under the attachment point of the big toe. Still runnable, I could not even tell there was a hole. P.M. 1 with Julia in 10:08, 1.5 with Jenny in 13:15, 2 with Benjamin and Jared in 17:12, 0.7 alone in 4:48. A.M. Ran the first 2 with Ted and Jeff. Then 6 more with Jeff. Decided to freshen up my sense of pace for the race on Saturday. Ran a mile at a conservative marathon pace in 5:42. Earlier Jeff and I were talking about the lazy girls on his brother's cross-country team that go out for 0.5 until they are out of sight of the coach, and then sit in the bushes for the remainder of the run. No wonder high-school coaches overdo on speedwork. They are probably afraid there students would do nothing otherwise. So I was feeling just like those girls at the start of the tempo mile and we ran the first 200 of it at 6:00 pace. Then we got into a good rhythm, but it still felt easier than I expected for the conditions - it was about 27 degrees and I was wearing pants and a jacket. Total time for 8 miles was 1:01:02. P.M. 1 with Julia in 9:42, 1.5 with Jenny in 12:36, and 2.5 alone in 18:30. A.M. 1 with Julia in 9:41, 1.5 with Jenny in 12:07. She PR'ed on the last mile of it with the time of 7:30. Then 2 with Benjamin in 15:26. SLC marathon tomorrow. P.M. Jogged from the car to the SLC marathon expo, back to re-park it, an back from re-parking it. It was windy. 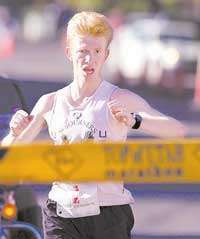 A.M. Executive summary: Salt Lake Marathon, 2:34:07, 6th pace. Windy day, slow times. Overloaded field, got outclassed into the no money land. On the positive site, collected nice LDR circuit points for being first in the circuit, and for the first time in my life (out of 43 marathons) ran a negative split on a non-St. George course. Talk about being a slow learner. Details: Stayed with Adam and his family the night before. That made it very nice for getting to the start as he lives right next to it. Met up with Kory, and Dave Holt at the start. A pack of Kenyans/Ethiopians at the start, Shin Nozaki, Alexander Thomas, Matt Harmer. Trouble, but hopefully there will be enough Kenyan DNF's / jog-ins to make top 5. In all truth, though, I need to work on being fit to race those guys honestly, being able to beat them in the half marathon to begin with, rather than counting them at the start and hoping enough are going to have a bad day. Adam made a nice map of the Salt Lake City Marathon on the Course Tool, so when I say the mile was supposed to be X it means based on 2:30 pace projection and the elevation profile the Course Tool thought this how fast I was supposed to run it. Half and full marathon started together, so that was nice. Relaxed through the downhill first mile with mild headwind in 5:49 (target 5:31). Perhaps too much relaxation. Adam and Kory fell back a bit. I motioned to them to catch up, but they thought the pace was too fast. So I made a move and caught up to the Kenyans accompanied by some half-marathon runners. Next mile was 5:39, it was into a more significant headwind, but not a complete killer (target 5:44) . On the third mile the Kenyans were done with the warmup. Nate Hornok, who was running the half at first went with them, the later came back to me. The headwind was the same as in mile 2. Got 5:49, target 6:02. Good, lets hope not too good. On the fourth mile we turned on 21st south and headed down a nice 4-5% grade. I passed Nate and did not care. Finally no headwind, but not for long. So I figured I'd make up some time. Got 5:04, target 5:11. Eased off on the next mile, Nate caught up to me, we chatted a bit, I sat on him for a quarter or so. Then at around 4.6 it was time to say goodbye, it was half-marathon turnaround point. So I was left alone. Could see Alexander Thomas up ahead. A little further Shin and a Kenyan that fell off the lead pack. That is a good sign for me. Kenyans, the type that come to the caliber of Salt Lake Marathon races usually hang on with the leaders until they literally cannot go any further at that pace. Next mile in 5:31, projected 5:22. Why so slow? But the split at 5 was 27:53, only a second slower than 2:30:00 projection. Hit the Sugarhouse loop. This has been one of my least favorite parts of the course. Today it ended up being my favorite part of the stretch between 5 and 13 miles. Next favorite was the climb on Keller Lane between miles 8 and 9. The reason being not that all of a sudden I've become a terrific hill runner. Rather, those were the only sections on that stretch that did not have headwind today. Mile 6 in 6:01, target 6:05. Encouraging. And then the wind got stronger. Do not remember my splits on the next few miles, but I got to 9 in 52:24, losing to 25 seconds to 2:30 projection. I believe I gained a couple of seconds on the Keller Lane mile (from 8 to 9). Mile 10 was supposed to be 5:37. Good luck with that headwind, only 5:57, 58:21 at 10 miles, last 5 in 30:28. Followed by a 5:59 for mile 11 that was supposed to be 5:25! Either the headwind picked up on that mile or I wore myself out trying too hard on mile 10. No worries, though. I had already realized that 2:30 ideal conditions effort today would not result in a 2:30 time today, and not just for me, but for everybody else as well, and I was going by effort while making a mental note of what kind of split that effort produced rather than stressing out about not hitting a target split. Mile 12 was 6:01 vs target of 5:49. Mile 13 6:25 vs target of 6:08. That is where we got the full gamut of adversity - headwind + uphill. 1:16:46 at 13 miles, 1:17:25 at half-way. The 2:30 guy put a good 1:34 on me on that stretch between 5 miles and the half. No more headwind, tailwind all the way back, or at least so I thought. On mile 14 just a cross-wind, but it feels so nice to be running downhill and with no headwind. 5:42 on the next mile, target 5:36. Not bad considering I had to shift gears from 6:25 pace earlier. Next mile in 5:36, target 5:25, followed by 5:34 right on target. I think the tailwind helped on this one finally. The weather started getting uncomfortably warmer. Mile 17 was 5:49, target 5:33. I think that is where the subtle fatigue of battling the wind in the earlier miles started to catch up to me in combination with a temperature that was not that warm (maybe 65 degrees), but being not used to it from the winter training took its toll. Do not recall my splits in the next 3 miles, but I got to 20 in 1:56:41, 2:15 behind the 2:30 guy. Passed a Kenyan, and then Alexander Thomas. Discovered a new way of fighting the fatigue. Loud grunts. Found them to be very effective. Ran the next 5 K in 18:43, and incidentally the last one in 18:43 as well. Worked my way through a crowd of half-marathoners. Saw Ryan Gurr. He told me I was in 7th place, and gave me the update on who was ahead and how they were doing. Not much hope. However, I anticipated that the weakest Kenyan/Ethiopian in that pack will either DNF or jog in, but only one. And sure enough, with about 1.5 to go I see him walking. Suzanna Thomas was there on a bike and yelled that I am now 6th or maybe 5th. So this Kenyan (his name is Festus Kioko), heard that, caught up to me and then pulled ahead. I got right on his tail, and I got really mad. I decided I'd sit on him, and then we'd duke it out in the kick, and he would have to work to beat me. Shortly afterwards he either remembered that there were 5 guys already ahead or for some other reason decided the fight was not worth it, and went back to the jog-in/walk-in mode. 2:34:07 at the finish, 1:17:25 first half, 1:16:42. Genna Tufa won in a very close race in 2:23:10. Race results are available at http://racecenter.com/.